We are honoured that the Federation of Canadian Naturists (FCN) has selected Bare Oaks as the location for the FCN library. When finished, the library will contain several donated collections of magazines, newspaper clippings, videos and other archival material from the world of naturism that go back to the beginning of the 20th century. It will be an invaluable resource for anyone interested in Canadian naturist history. Head Librarian – To organize and catalog the collection. Renovators – To fix up the inside of the trailer and to build a deck in front. Attendants – To maintain the collection and supervise during opening hours. Most of you are familiar with the community of Mount Albert. Bare Oaks Family Naturist Park is a member of the Mount Albert Business Association and a proud supporter of the 2nd annual festival. The first festival last year was a tremendous success with thousands of attendees. Expect even more this year! Pet Contests provided by Pawsitive Approach Pet Services Inc. 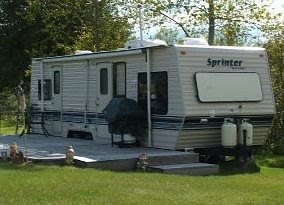 The following trailer has been seized for non-payment and is being sold, by auction, to the highest bidder. 1 bedroom with sitting area and eat–in Kitchen. There is a full sized electric Danby fridge, double sink, and gas stove. Oak decor with blue carpets, blinds and trim. The trailer is sold on a strict as-is basis. The auction will end on Tue 16 Sep 2008 at 13:06:52.